Twitter MP4 download is free, easy, safe, and fast with this method! The popularity of Twitter is beyond doubt. It allows users to upload videos in MP4 and MOV format from mobile apps and MP4 with H.264 video and AAC audio codec on the web. But when you see a fascinating twitter video and attempt to look for a download option, you're disappointed to find that there's no such button. Luckily, there are many third-party Twitter video downloaders coming to help. One of them is WinX HD Video Converter Deluxe which downloads Twitter to MP4 for free, quickly and easily. 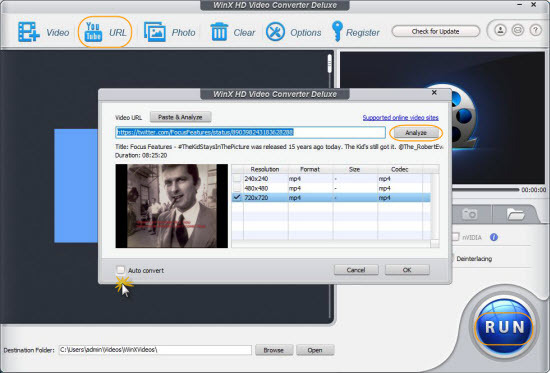 ★ A video converter but also a free video downloader. WinX HD Video Converter Deluxe is not only a program to convert videos among virtually all video formats, but also a tool to download videos from Twitter and other 300+ sites to MP4, FLV, 3GP, and WebM which function will stay free forever. ★ An easy-to-use and fast Twitter to MP4 downloader. Within three simple steps (input Twitter video URL -> select output quality -> begin downloading), users will copy Twitter MP4 video from online website to local folder. Equipped with the world's first-rate Intel QSV, MMX-SSE, Nvidia CUDA/NVENC, Hyper-threading and AMD 3DNow! technologies, download and conversion speed be will enhanced dramatically. ★ It is safe to use. Quite a lot free online or desktop-based Twitter video downloaders come with disturbing things, like toolbars, plugins, adware, malware, virus, and so on, while this tool will never bring such kind of things to your computer. 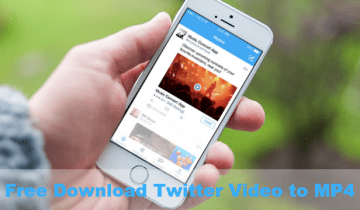 How to Free Download Twitter Videos to MP4? 3 Simple Steps Required. Since WinX HD Video Converter Deluxe is a desktop-based program, first of all you should click on the download link to save installation package on your PC/Mac and then install it following on screen instructions. Then, open WinX HD Video Converter Deluxe and do what we tell you below. Step 1. Input Twitter video URL into text field of downloader. Some people don't know how to get Twitter video URL. Never mind. I'll show you. 1)	Open Twitter website in your computer browser. 2)	Find the Tweet which contains your desired video. 3)	Locate the More option which looks like a drop-down arrow, and then click on Copy link to Tweet. 4)	Then, the URL for this Twitter video will be displayed. Just copy it now. Then, back to the Twitter to MP4 downloader and converter and hit YouTube URL button. Next, a smaller window will pop up. If you have copied the Twitter video URL, you should find that it is already pasted into the text field. If not, copy and paste the link now. Step 2. Analyze the Twitter video link and select output quality. Click on Analyze and you'll see the Twitter video title, duration (it may be incorrect but won't affect the resulting file) and available output options appear instantly. Choose an option with MP4 format and desired quality (such as 1920 x 1080, 1080 x 720, 720 x 480) and click OK to exit this panel. If there's no MP4 option, you can check Auto convert button to convert Twitter video to MP4. Step 3. Begin downloading Twitter to MP4. By default, this tool will create a folder named WinXVideos under disk C: for you to save the downloaded MP4 Twitter video. Or, you can click Browse to choose a different folder of your computer, Android mobile or any movable device as you like. If you get ready, simply click RUN to begin processing Twitter to MP4 download task right now. It normally takes a few seconds to finish that, certainly also depending on your network speed and computer configurations. ▪ Convert Twitter video to MP3, AAC, M4R (iPhone ringtone format), and so on. ▪ Convert Twitter video to MP4, MOV, AVI, WMV, HEVC, FLV, M4V, MPEG2, 3GP, SWF, DV, etc. ▪ Convert Twitter video to fit for iPhone, iPad, Android, Windows Phone, Sony, Apple TV, and nearly all devices. ▪ Trim, crop, merge Twitter videos and do more edits. ▪ Free download videos/music from YouTube, Facebook, Instagram, Vimeo, Dailymotion, SoundCloud, etc. ▪ Make vivid photo slideshow videos as MP4 for uploading to Twitter and other sites. ▪ Record videos on/before screen for uploading online or other purposes (available on Mac only).